If you are a woman in the years before menopause you probably thought you were well past the threat of pimples showing up. Think again, a number of women experience a flare up of acne during perimenopause due to the shifting hormones. Fortunately, there are treatments that can help to prevent breakouts and alleviate the blemishes. What causes breakouts in the years before menopause? Male hormones called androgens and male-type hormones such as testosterone, drive production of the skin oil that helps to cause acne. Once your skin has too much oil present, you can develop clogged pores and infection from acne-causing bacteria. Teenagers get pimples because their hormones shift and surge, and women in perimenopause experience similar types of hormonal shifts that can lead to overproduction of oil in their skin. Add to that, skin that is more prone to dryness due to a decrease in circulating estrogen and you have the perfect storm for oil clogged within the pores trapped by dead skin cells at the surface. How do I combat these frustrating perimenopausal breakouts? I have found that most women initially turn to the over-the-counter acne treatments marketed towards teenagers. Unfortunately, these treatments don’t work so well for adults and can lead to significant drying of the skin where applied making the problem worse in the long run. A better solution comes in the form of topical retinoids. Retinoids are derived from vitamin A and can help to clear the oil from your pores, and also will rejuvenate your skin, erasing tiny lines in the process. I typically recommend using either a liposomal retinol or retinaldehyde, which are gentler forms of vitamin A and are less likely to cause irritation or photosensitivity. I discourage my patients from using retinoic acid or tretinoin, these are the strongest forms of topical vitamin A because they do not require your skin to convert them to a usable form. This can lead to more irritation of the skin. Encapsulated liposomal forms of vitamin A and retinaldehyde are used in product lines like Osmosis Skincare and Fitglow Beauty. In addition, a series of professional skin treatments can be helpful to prevent accumulation of debris within the pores. I recommend discussing your unique needs and goals with a trusted aesthetician or skin health professional to determine the best course of action. My patients have seen great benefit with targeted medical grade peels and acupuncture. 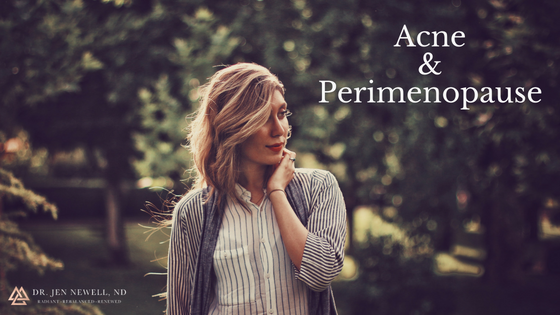 Luckily, acne in perimenopause likely will abate once your hormones settle down but to get in under control more quickly, you may also need to consider an inside-out approach to treatment to balance your hormone. In some cases, Bioidentical Hormone Replacement Therapy (BHRT) or carefully selected herbs and nutrients may be required in addition to appropriate topical treatments. Not only can these treatments help to clear up your skin and restore it’s youthful healthy glow but they are also beneficial in treating other symptoms associated with hormonal changes happening at this phase of life – mood swings, insomnia and sleep disturbances, hot flashes, vaginal dryness, and changes in libido. If you are struggling with adult onset acne and are in the years leading up to menopause, please reach out and book a free 15 minute consult with me to discuss your needs and goals. During this free 15 minute consultation we will discuss where you are at, where you want to get to and how we can work together to get you there.